Today the Meatball and Salted Cod bring you bacon mini quiches and another episode of our Lunchbox Extravaganza! This looks a lot more complicated than it is, but is actually quite easy and is so worth it. 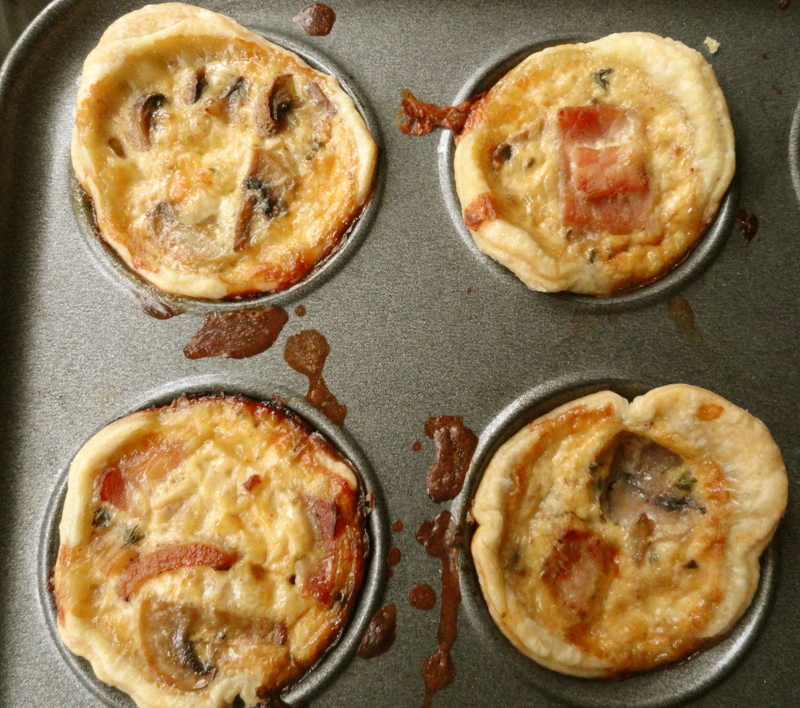 You can have it as a normal quiche or as mini quiches to take for lunch. 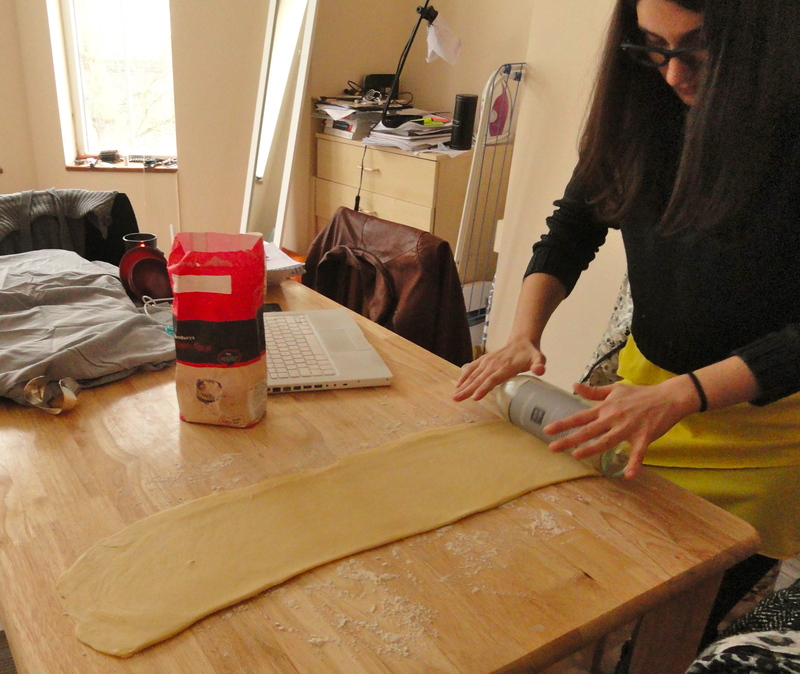 Start by making the dough, Gordon Ramsay style. It’s really easy and only takes a few minutes actually working on it (although be prepared for a lot of rolling), the rest is resting time. While your dough is rising in the fridge prepare the filling. We used fried bacon, mushrooms, cheddar and thyme but you can make any combination – salmon and ricotta is really good, as well as mediterranean grilled vegetables. 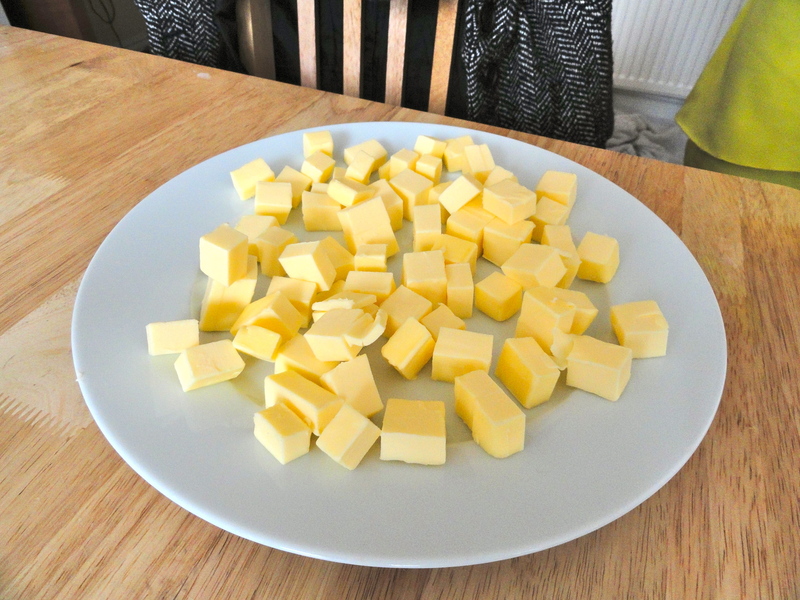 You then combine these ingredients with a milk and egg mixture. You can also use cream instead of milk (or half and half) but after the crazy amount of butter going into that pastry we decided to save our growing stomachs from any more grease. We didn’t really use any measurements, but you should use a minimum of two eggs and make sure the mixture is not too liquid, otherwise it won’t settle properly. 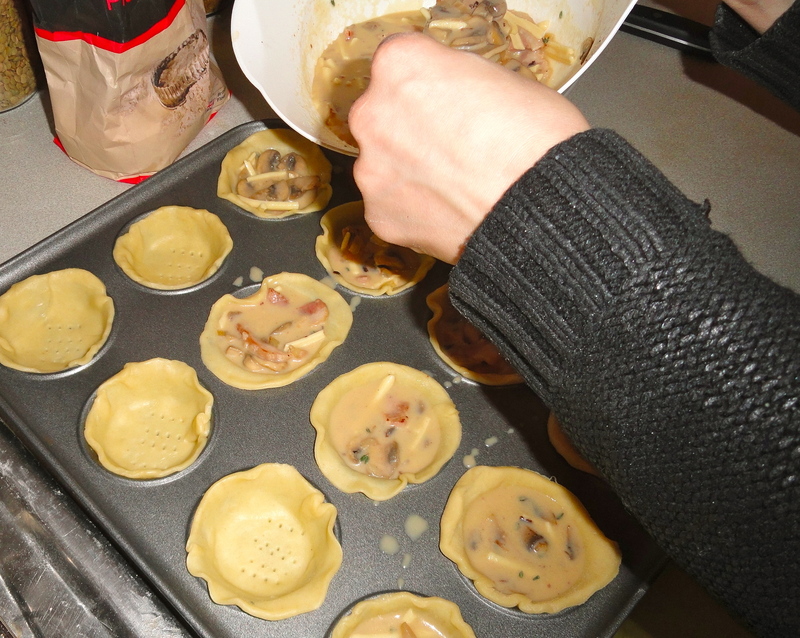 Cut the pastry in the shape of the tin you are using (we cut in in small circles for our mini quiches) and fill them up. Put them in a preheated oven at 180 for 15mins, but keep checking to make sure the pastry is not burning. These quiches are great served hot or cold, so you can make a big batch and eat them throughout the week. They can also be frozen and reheated later. London is freezing at the moment. If you, like me, are living in a chilly, damp, poorly insulated house, this recipe is a good excuse to use the oven as a heater for a little while (as well as adding badly needed heating, leaving the oven open afterwards makes the house smell of bacon pancakes! And that can never be a bad thing.). Described as “Swedish comfort food” by Mr Meatball who I made it for yesterday, it needs very little work and few ingredients, so it is perfect for someone lazy, living off meagre student finances with an empty fridge. Rumour also has it Swedish air stewardesses make this a lot. Put your oven to 225 degrees. Cut the bacon strips into smaller bits a wide, shallow oven pan. This is easily done with scissors. Put the pan into the oven and let the bacon pre-fry until it looks like the first picture in the slideshow, for about 10 minutes. Whilst that is in the oven, mix the flour and salt, and whisk in the milk slowly until you have an even mix. Crack in the eggs, whisk, and pour this on top of the bacon in the pan. I cut som parsley into it too but mainly to make it look pretty. Put the pan into the oven for 25-30 minutes until it has gone golden, and risen considerably. Once you take it out it will collapse upon itself. It should be a mellow brown in the edges, but gooey and yellow on the middle and inside. Cut into large slabs and eat with copious amounts of lingonberry jam. Enjoy! * This is a sour, red jam, which like salt, comes in excessive amounts with most things considered Swedish traditional food. You can pick some up at your nearest IKEA, or if you’re in central London, get some here. Or you can supplement this with Cranberry sauce, but that woud be a shame.